Came on to finish the post I wrote last night but it's now disappeared and hasn't auto saved so will have to start again. Another delay to the next update. Sorry. A league campaign of six games this month. This will give us a good indication of where we might be aiming for position wise. Some tough games come the end of the month so we would need to plan ahead to be ready for them. 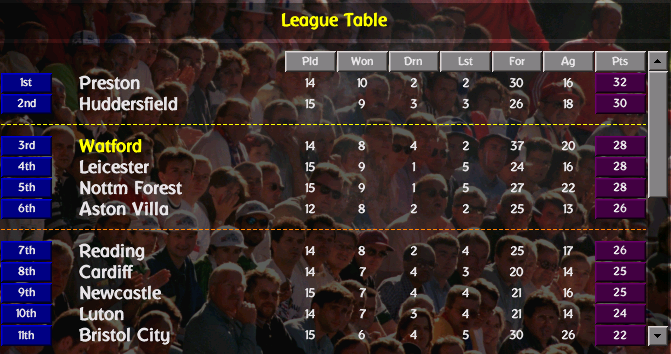 Another unbeaten month for us and we find ourselves in a really good position. Goals conceded is still an issue with 20 shipped so far already. 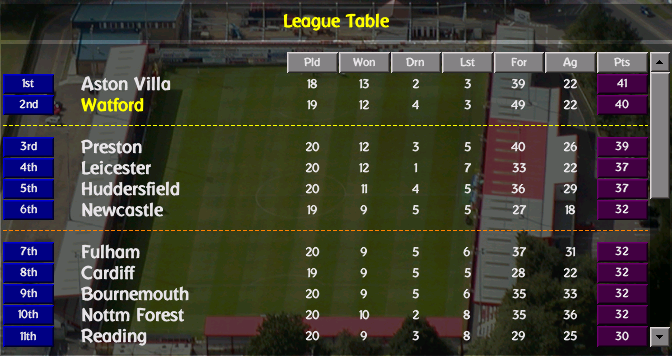 We did manage to secure a couple of clean sheets in the month though so there is improvement. Of the six games in the month, four of them were at home and yielded attendances of 16218, 18717 27084 and 25478. 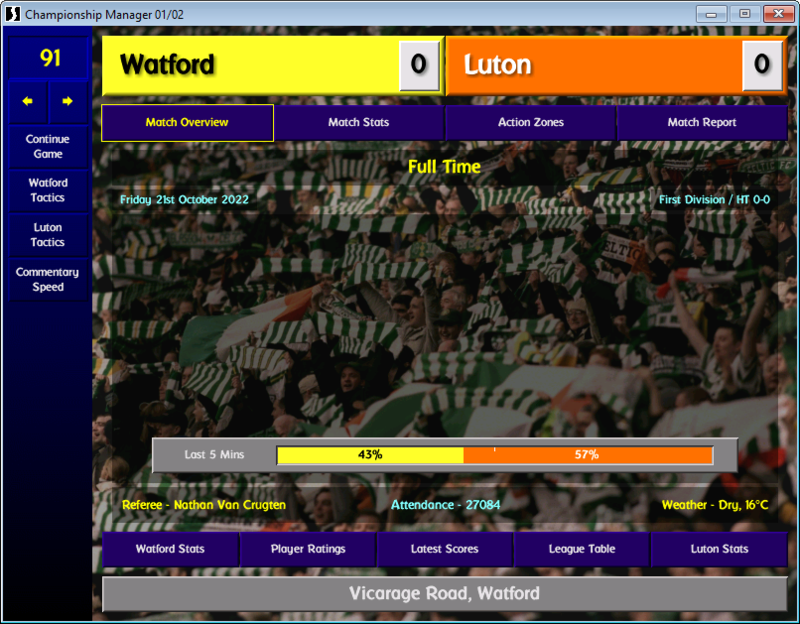 Started low but improved for the local derby with Luton and stayed up. Despite all the home games. income for October still only came to £1.54m which was actually less than we made last month when we only had 2 home games. It's weird and I'm not sure where the money is. Outgoings still high at £2.84m. So another £1m+ loss for the month. Frittering away quickly. This leaves the bank balance at £9.23m and a transfer fund of £4.4m. You seem to have favoured him and Wilson over Studge and Toure? Toure is actually a centre mid, despite all the goals. Gave Hopkins a run but he hasn't really produced. I'll put it down to still settling in. Uffe Bech has been playing well when called upon so may get the nod from the start again soon. Ah unlucky with the post not auto-saving Happened to me too, generally if I opened the thread in another tab. E.g. to respond to posts made after previous update. Then went back to story and its been overwritten. Strange one. Anyhow, an unbeaten month! Good work, seem to be gaining more confidence as the season goes on. I reckon you'll be up there before long. Could extra money be coming from instalments for transfers sold? I think gate receipts are just generally low. October ££773k for the four games. ££281k TV revenue. The difference was made up of players sold in September at ££739k. May need to rewrite your intro of Watford not winning anything ! Decent month on the pitch. You might need to spend that money while you have it. It won't stay in the bank for long at the rate it is going down the pan. We've got ourselves into a decent position. We need to make sure we try and stay in contention. Our first game of the month takes us on a difficult trip to the KC Stadium and a game against Hull City. A decent side, they had finished in the playoff places for each of the last three seasons in the second tier. They were a bit off the pace this season so far though, down in 12th but they would be no pushover. We would need to be on our game to get anything from it. I was going into the game as Manager of the Month for October with Daniel Sturridge gaining Player of the Month despite injury during the month. Lucas Piazon dropped out with Haris Vukcic came in, Andy Hopkins also made way for Uffe Bech to return to the line up, Daniel Sturridge back fully fit was promoted to the bench. We were fast out of the gate and were rewarded early as Uffe Bech got on the scoresheet after just three minutes. He bulldozed his way to his and our second just two minutes later. We could then sit back on that lead and protect what we had. 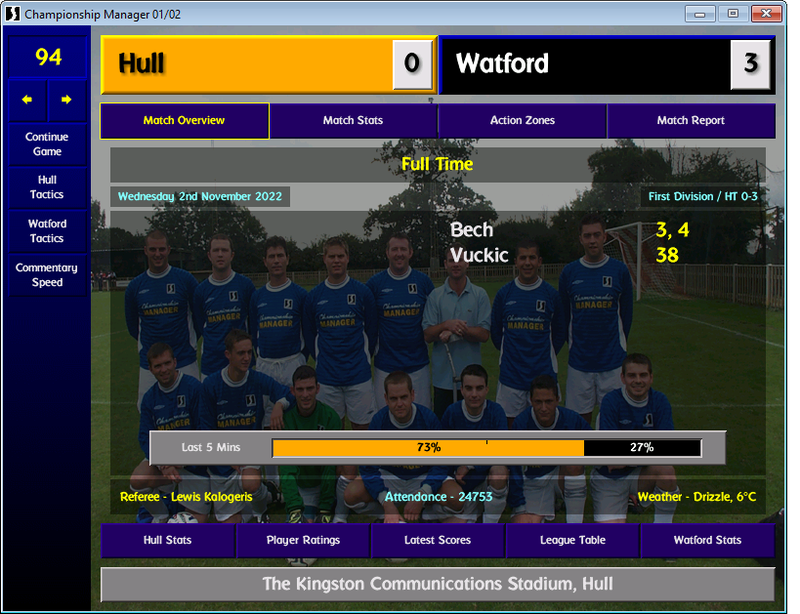 We went one better as the other man I had brought into the team Haris Vukcic scoring on the stroke of half time. The job was pretty much done but we had to avoid any kind of slip up in the second half. We played it perfectly. An exibition of keep ball when we had it and a masterclass in defending when we didn't. Uffe Bech, Haris Vukcic, Sean McDermott, Shane Duffy, Birama Toure, Martin Hinteregger, Medhi Benatia, Joona Toivio, Johannes Nieminen, Paul Duffy, Neil McLaughlin and Sam Magri were all called up by their respective countries after the game. That was some haul for a side in the second tier. They would only leave us briefly though and not before the next game which would see us pitted against Bristol City in the West Country. I had a bit of an affiliation with the city after living there for a short while. It was a city I loved. 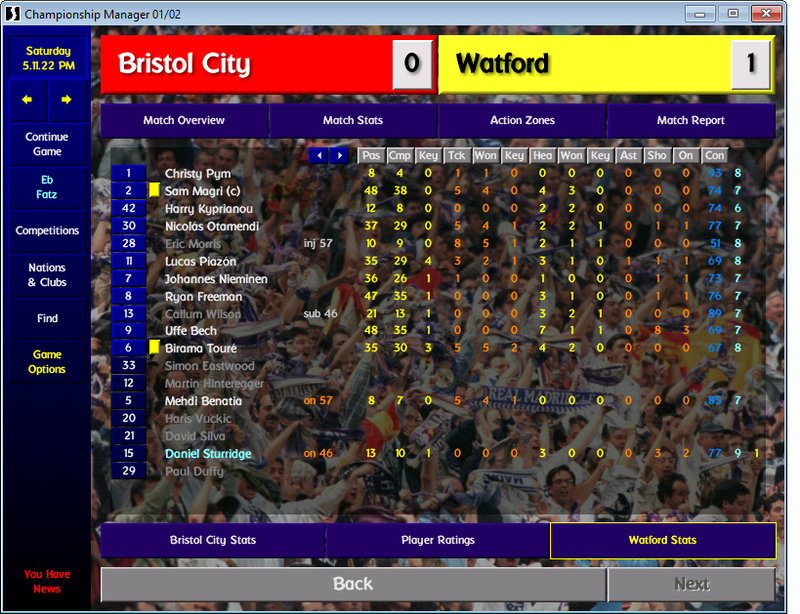 I also knew I would find myself managing here at some point, either with City or their cross town rivals Bristol Rovers. They were another mid table side and if we continued the form we were showing then we should have too much for them, but at the back of my mind there was still a niggling doubt about how we played away from home. Were we too open? Too expansive? Possibly. But it was the only way I knew how to play. Attack is always the first form of defence in my book. Haris Vukcic again traded places with Lucas Piazon and despite his goal found himself on the bench as he had not fully recovered from his previous outing. Birama Toure also needed a rest but I kept him in the side in the hope that we could get ahead and I could take him off later in the game. We were instantly on top in the game but we were not able to make the advantage count as we had in the previous match. Numerous chances yielded nothing and it was level at the break. Most of those chances fell to Uffe Bech and by rights it should have been him I took off at half time for not putting at least one of them away. But it was Callum Wilson I took off after he failed to muster one shot, let alone one on target. Daniel Sturridge was the man to replace him. It didn't have the desired effect. In fact, the first thing of note was loanee Eric Morris going off injured on 56 minutes, Medhi Benatia replacing him. I hoped his injury wouldn't be too long as I wanted to run a little experiment with the young centre back. On and on we went, chance after chance. 15 shots in the game 9 on target but no goal and I was becoming frustrated. Time ticked away, until we entered the final five minutes and I felt our chance had gone and we would have to settle for one point. Two players thought differently. Lucas Piazon received the ball in the centre circle and looked up. He saw his central striker had already begun his run stretching his opposing centre back. Piazon played the ball up and over the defenders head and landed it on the instep of the forward. That one touch was enough to get the ball out from his feet and in front of him to run on to, the second touch was to fire it back across goal, past the keeper and into the back of the net for the winner. 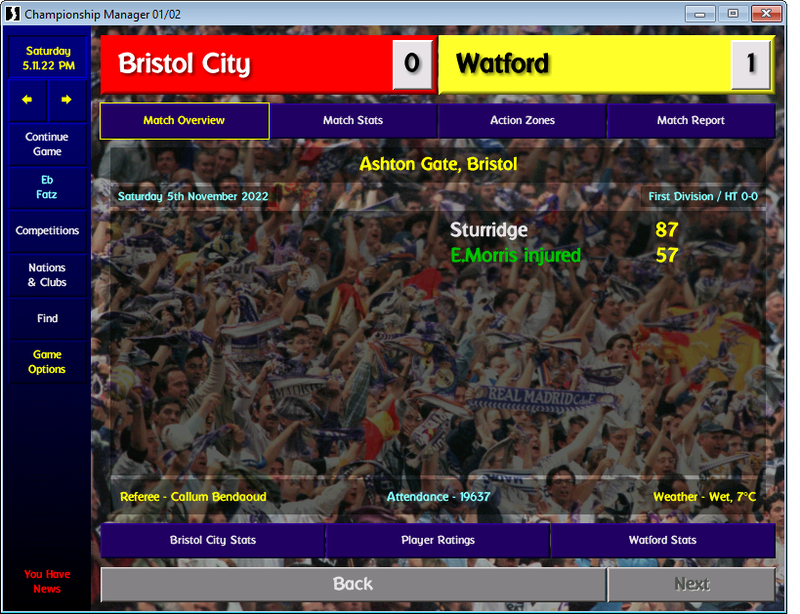 87th minute, match won by Daniel Sturridge. We held out comfortably for the final three minutes to secure the full three points. We scraped it. Skin of our teeth to take the three points. But you need that little bit of luck to go your way if you are going to do well. At any level. I hoped it would continue. Thankfully Eric Morris would only be out of action for a week. There was a chance that he may even be back for the next game as we returned home to Vicarage Road for the first time since the end of October to entertain a former side of mine, Newcastle United. Now they had been going through a weird old time since I had stepped down as manager in May 2019. I had won League One, the Vans Trophy and miraculously the FA Cup before leaving you may remember. Alan Pardew was my successor and won the League Cup and the Championship before the season after, Pardew being fired mid season and the club being relegated from the Premier League. Part of the reason why they may have struggled in the top tier is the fact that they had not signed a player since I was manager. The final player that they had signed was Juan Narvaez on a Bosman free on July 1st 2019. A deal arranged by me but I had already left the club by the time he arrived. It was now obviously November 2022. They had just 19 players on their books, they had no registered goalkeeper on the books, three of the 19 were left backs, almost half the squad were unhappy but, amazingly, they were doing well this season. Until a draw and loss in their last two games they had been up in the playoff places but were now 11th. They played again before they met us and drew that also. But I knew they could cause us problems despite the upheaval at the club. 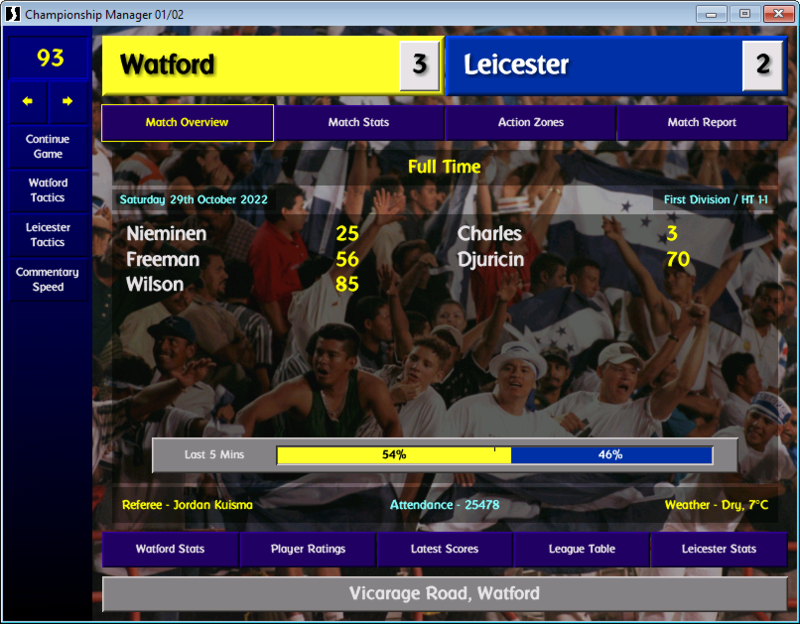 Everyone else was very confident on Watford winning the tie but I knew there could be a sting in the tail. Morris didn't quite make it to full fitness so Benatia started with Shane Duffy coming onto the bench. Harry Kyprianou was dropped from left back also with Neil McLaughlin coming in. Kyprianou's form was ok but he, McLaughlin and Hinteregger had all played a similar number of games there during the season and it was close on form but McLaughlin had played slightly less games so I brought him back in. My fears on a potential banana skin were realised on 9 minutes when Newcastle took the lead. A lead they then doubled when they were awarded a penalty 4 minutes from half time. I repeated the trick of replacing Callum Wilson with Daniel Sturridge at half time as again Wilson registered no shots in the game. I also instructed the players to go more direct and flood their box. It mattered not. 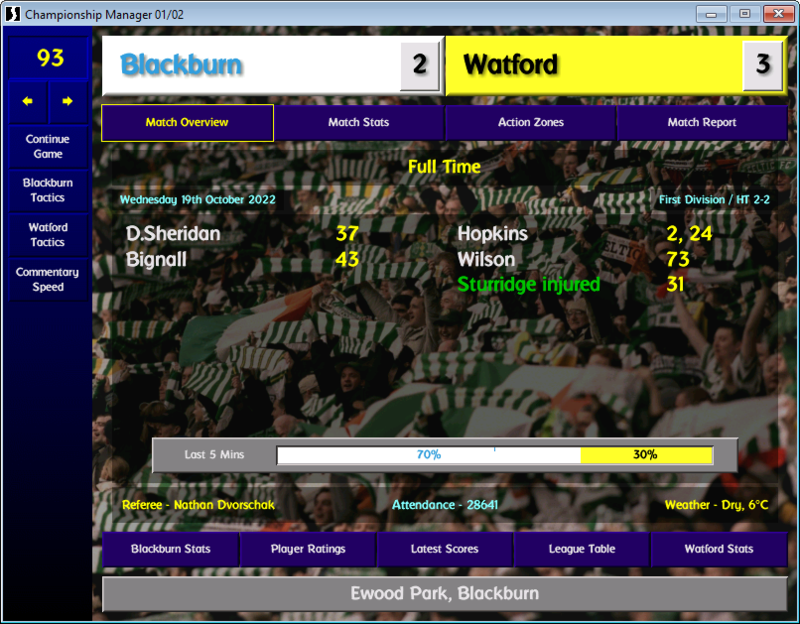 The pressure we put them under yielded no goals, only an injury for the returning McLaughlin to confound my misery. Funnily enough I could see the defeat coming so could take it on the chin, others were shocked by the outcome. We would have seven days to get over that loss. A full week to get the mindset back to where we were and not thinking about losing to a team that by rights we should have beaten. But I knew all those Newcastle players, I knew that they were battlers because I signed most of them and I made them into battlers. We moved on. 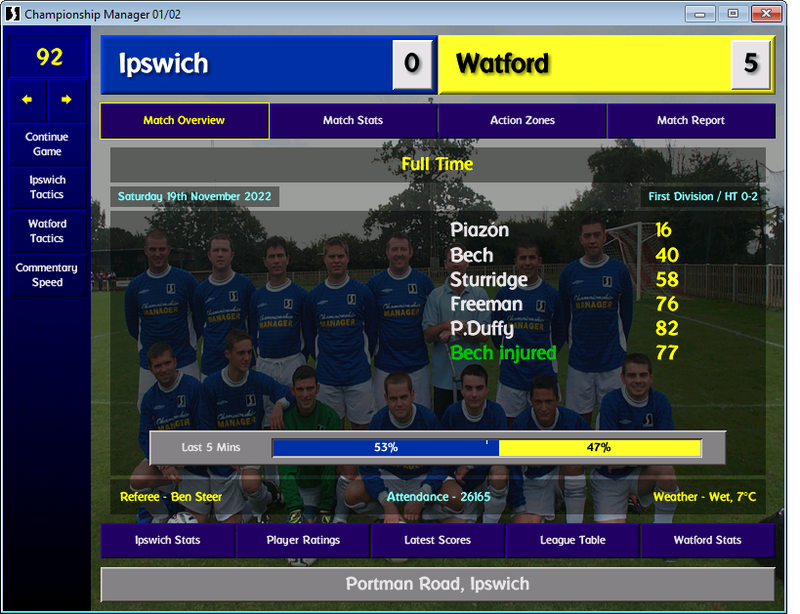 And the next encounter was Ipswich Town away. McLaughlin would be missing I knew,I was happy to find out that Nicolas Otamendi's one match suspension for collecting 5 yellow cards would not start until later in the month. A raft of bids came in for wantaway midfielder Chris David, some of which I negotiated and some I accepted. 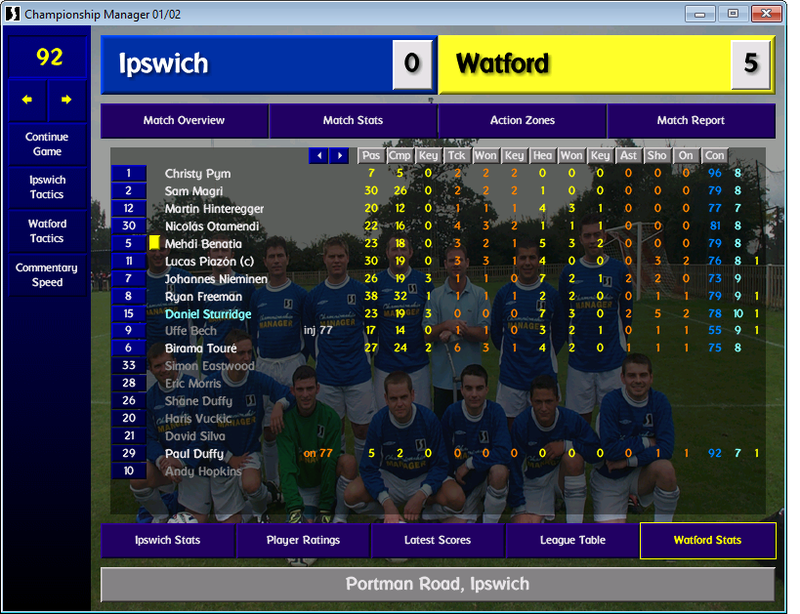 His future was not sorted by the time we arrived in Ipswich though. David was not in the squad. And after registering no shots in the last two games, Callum Wilson was out of the team. Daniel Sturridge started and Paul Duffy came on to the bench. I was dropping him from the squad altogether may be the kick up the backside he needed to up his game. Martin Hinteregger came in for the injured McLaughlin at left back and the fit again Eric Morris came back to the bench. We started well and quickly as we always seemed to and we had already had an Uffe Bech strike disallowed before Lucas Piazon actually gave us the lead. 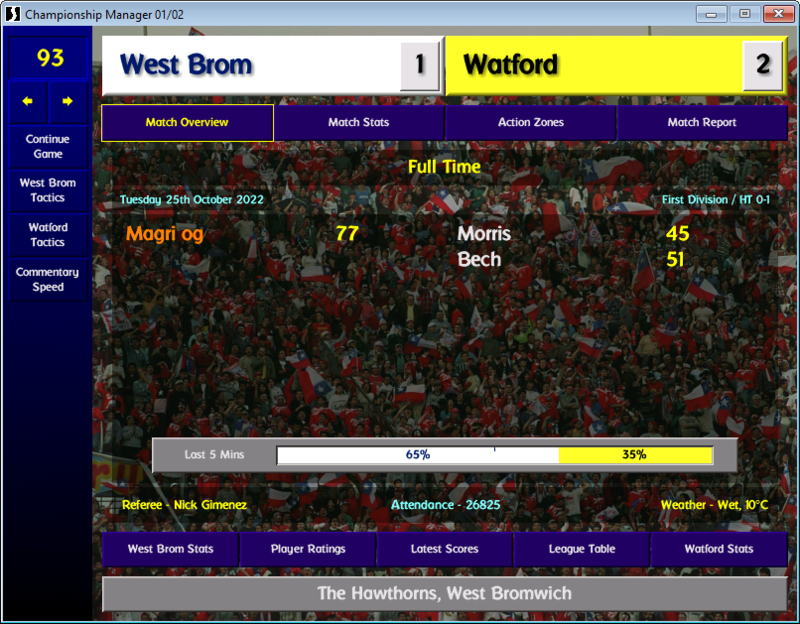 Bech did in fact get his goal just before half time to double our advantage. Sturridge added a third and Ryan Freeman a fourth. 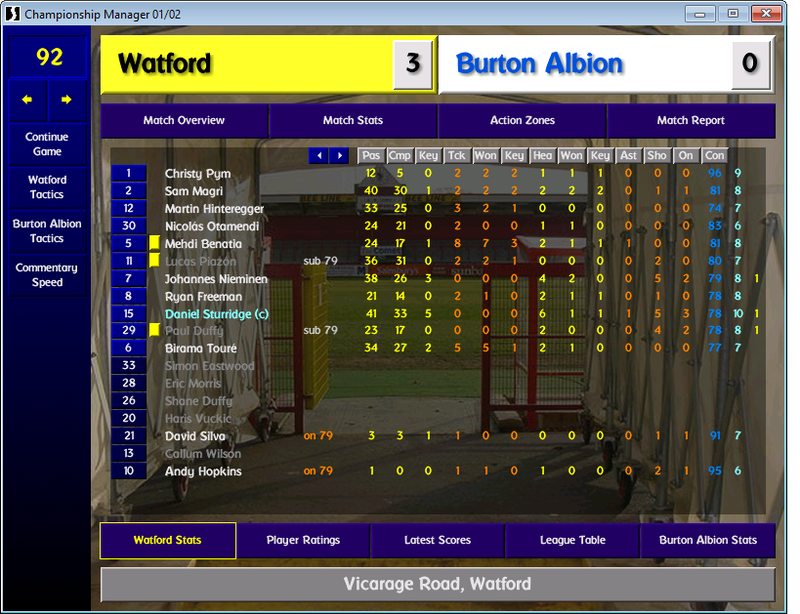 Bech picked up a knock in the build up to the fourth and was replaced by Paul Duffy which was a bit of a downer. By that time, the game was comfortably won but Duffy took his chance and bagged us a fifth, eight minutes from time. The perfect response to the loss. Nieminen with two assists did well but upstaged by Sturridge who backed up his goal with two assists of his own. It was almost the perfect performance. It was the perfect way to respond to defeat and I was made even happier when our game was moved forward to play on the Friday night, the 25th of the month. That meant Otamendi could play as his suspension started on the 26th. So he would actually miss the first game of next month instead of the last of this one. That was a massive bonus. 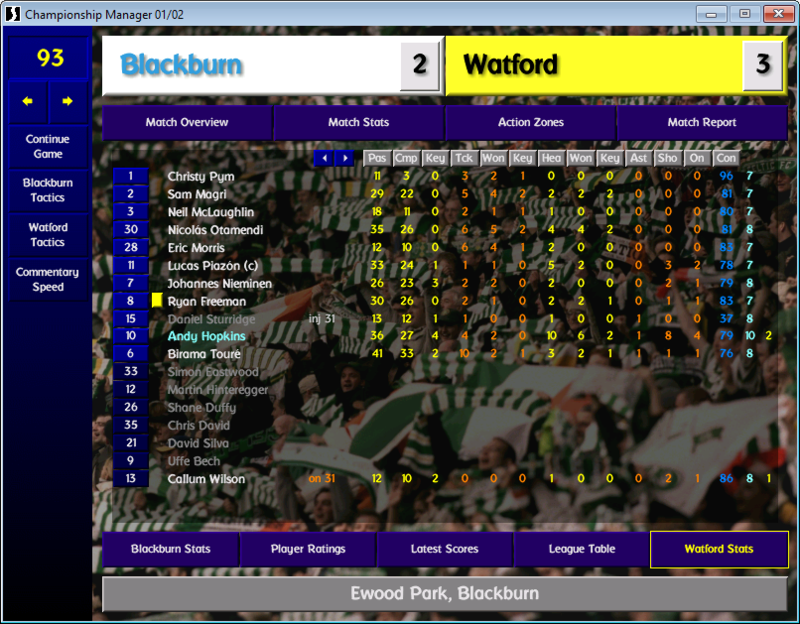 And it allowed me to choose a back four unchanged. I would though have to be making a change up front as Uffe Bech would be out for a month with a twisted ankle. 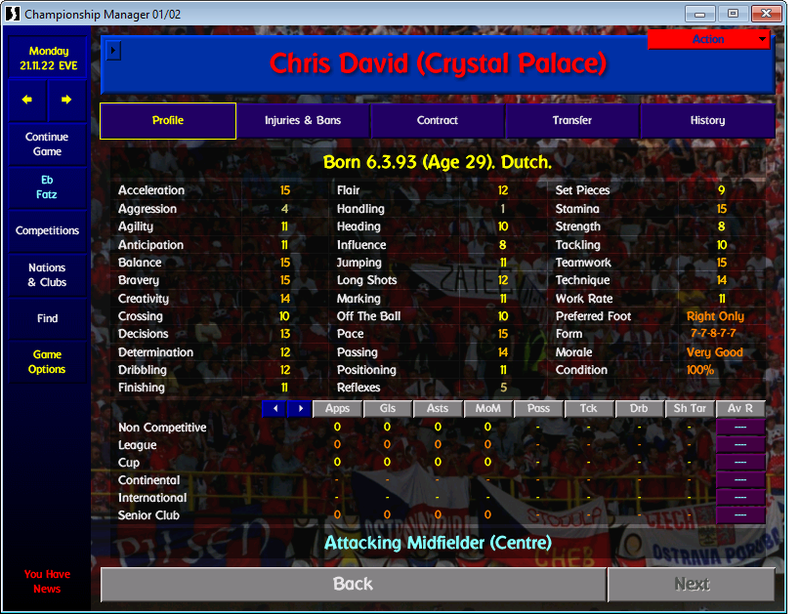 There would be no Chris David either as he made his switch to Crystal Palace during the build up to the game. Burton Albion would be our opponents. After Duffy's goal in the Ipswich win, he kept his place up front with Callum Wilson back onto the bench. Once again, a fast start and an early goal and it was Duffy who got it after just seven minutes. An early lead is a feature I'm getting used to and something I was obviously enjoying. We weren't able to build on that lead though and it was just the one goal scored at half time. 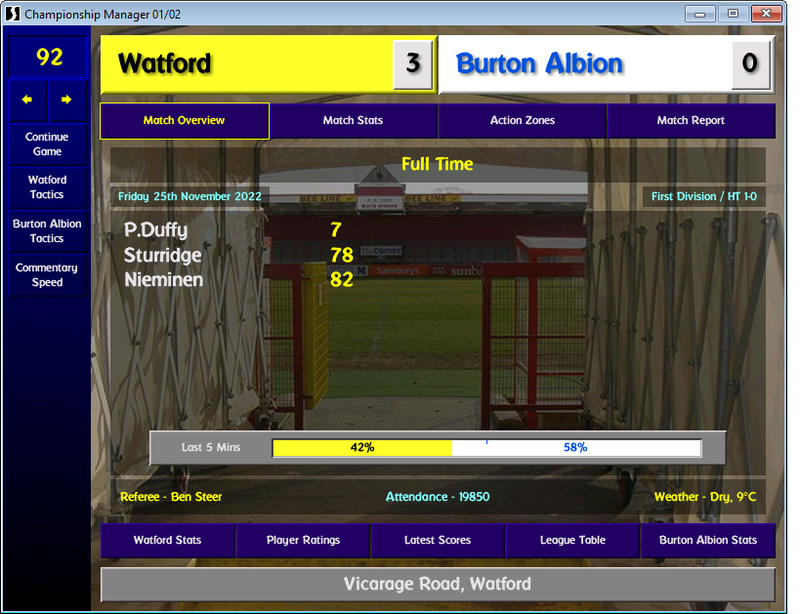 Burton kept themselves in it in the second half until I spoke to the fourth official and had a substitute arranged. David Silva was stripped and ready to come on and was waiting for the ball to go out. It didn't go out but as we passed it about we managed to advance up the pitch and the ball found it's way to Sturridge who drilled home to give us a two goal lead. I still went ahead and made the sub anyway, Silva had spent far too long sitting on the bench to justify his £50,000 a week wage. I appreciated he couldn't manage 90 minutes any more but he needed to play more. 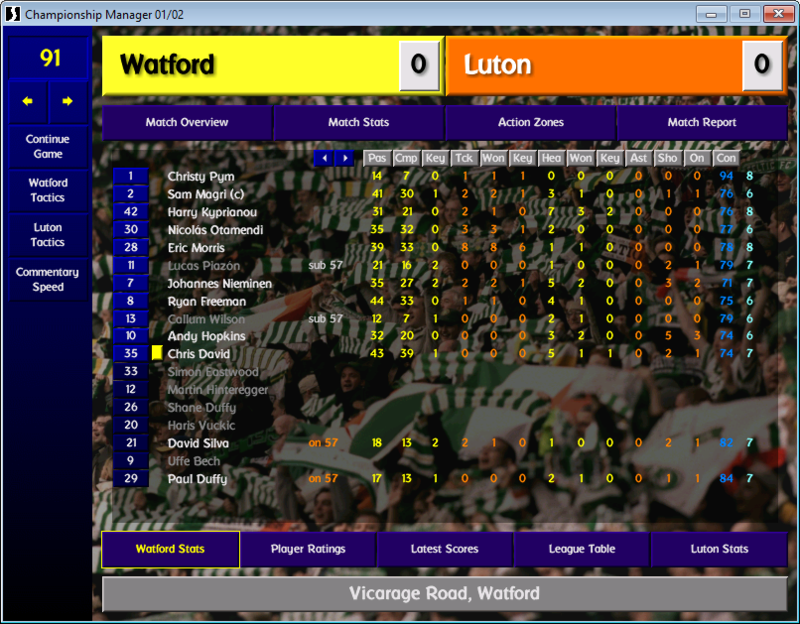 He came on for Piazon, Andy Hopkins also came on for Duffy. We managed to grab one further goal through Johannes Nieminen to give us a good look to the scoreline. No more games in the month but we did learn who we would face in the FA Cup Third Round and that would be Reading, a team in our division. Another big month and things are still going way better than I would have expected. The Newcastle result, I expected to be the start of us dropping off but we got straight back to winning ways. The two home games in the month again. Attendances of 22150 and 19850. Quite low still and one of which under 20k. Hopefully they will rise if we stay near the top of the table. Income for the month was higher this month due to the transfer fee and amounted to £5.10m and outgoings slightly down at £2.69m. So a profit of £2.4m for the month. So the bank balance at £11.28m and a transfer fund back up to of £6.5m. Good response to the Newcastle defeat. Bit disappointed with Hopkins' season so far. Just hasn't taken off at all and barely plays now but understandable with form of Sturridge, Bech, etc. Yep, Pym man of the match tells you how bad it was. 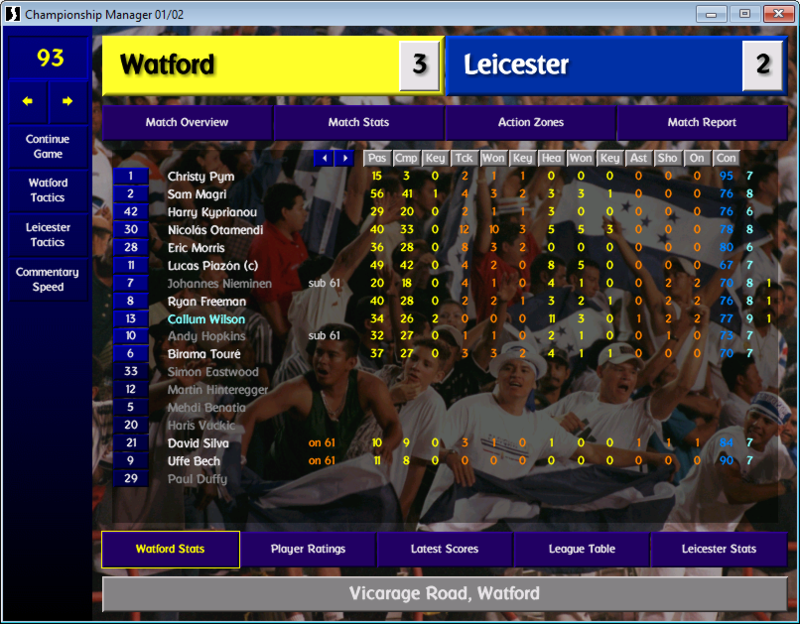 Or how resilient a squad I built when I was there. One or the other. Honestly still can't believe they have hit the ground running so well. 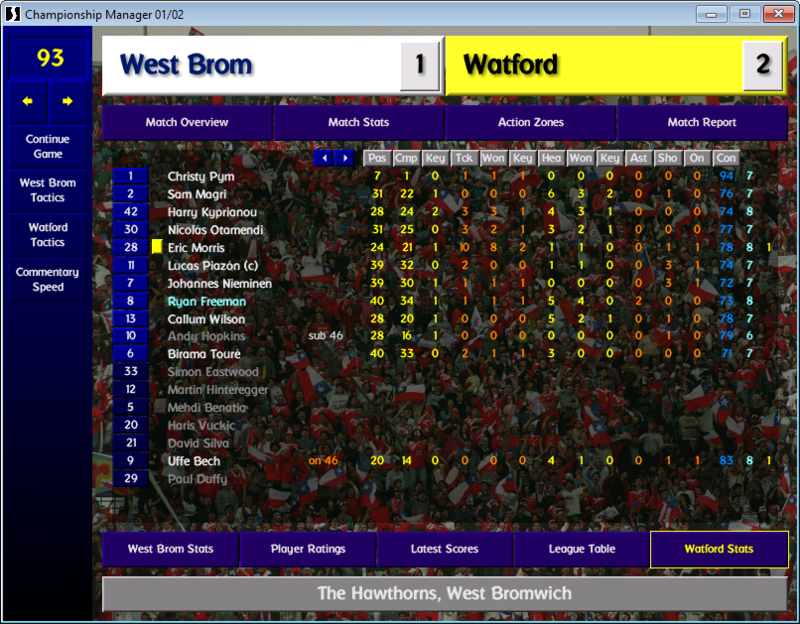 The joys of the old 4-1-3-2! I still think the title might be beyond us but my mind is starting to wander and is asking itself whether winning the playoffs is a big enough trophy to be able to move club on it? A couple of updates to catch up on so I'll make separate posts (when I've read both in work ). An unbeaten October can't be sniffed at, and a couple of clean sheets suggest your defensive problems maybe easing but then conceded a few in the other games, looking at the table only one other team in the top ten has conceded more than you, but attacking wise you're smashing everyone which is why you're well in contention for the title. Hopefully Studge can recover soon, but you've the strength up top to do without him for now. Lets hope Villa slip and you can take advantage!